It's no surprise that emerging technology will bring major changes to logistics, and supply chain in the coming years. From driverless trucks to blockchain, we’re breaking down the biggest supply chain innovations on the horizon. It’s a raven…it’s a dragon…no, it’s a drone! Industry experts have been talking about commercial use of drones for the delivery of goods for a few years now, and the technology behind them is quickly improving. Amazon began testing its Prime Air delivery service early this year—a service they say will “safely get packages to customers in 30 minutes or less using small unmanned aerial vehicles”—no blood magic necessary. 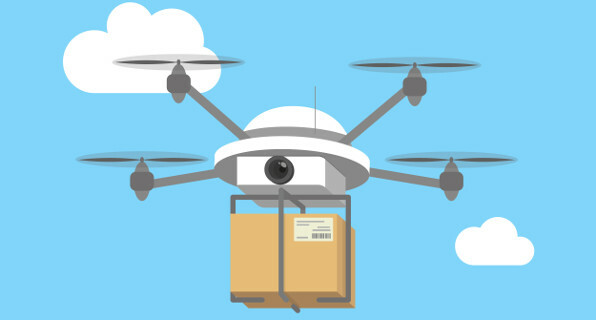 Though there are several safety concerns and FAA restrictions to overcome before these vehicles become ubiquitous, now is the time to start thinking about how drones will affect the future of logistics. While these unmanned aerial vehicles (UAVs) won’t completely replace traditional over-the-road transportation, they will provide a new mode for last-mile package delivery—which will be especially useful in high-traffic or remote areas. Though the thought of seeing a truck rolling down the highway with no driver is almost as eerie as encountering a White Walker, this may be a common sight in the not-so-distant future. A convoy of self-driving trucks recently made a successful trip across Europe, proving that the technology is nearly ready, and that the remaining barriers are largely regulatory. Efficiency gains from this new technology will be huge, and could alleviate the ongoing driver shortage problem the industry is facing. While autonomous vehicles aren’t ready for prime-time yet, many trucks are becoming smarter—acting as mobile computers. As trucking companies continue to grapple with the driver shortage over the next few years, self-driving features may help them attract and retain more drivers. This type of technology would significantly reduce the burden on a human driver—particularly on those grueling long-haul shifts. Acting as their own personal Night’s Watch, self-correcting sensors in trucks could help drivers stay awake and avoid mistakes. 3D printing, also known as additive manufacturing, is a process by which material is laid down in thin layers to form a solid object. Though not yet ready for broad adoption, the technology is advancing quickly, and the cost of 3D printers is dropping. Manufacturers and transportation companies should understand how this trend may affect them, and assess their current high-volume product segments before 3D printing arrives like an army of wildlings. Wearable technology is still a nicety for consumers; however, the transportation industry sees significant potential for its use in trucking, particularly as it pertains to driver safety and risk aversion. Wrist pieces (such as Apple Watch), headbands and headsets, and even technology-enabled clothing can offer truck drivers measurable benefits in terms of navigational efficiencies, driver health, and safety precautions, all while communicating data back to fleet managers to give them actionable insights. We all know that the night is dark and full of terrors. Perhaps the most impactful use for wearables in trucking safety today is monitoring driver fatigue. Hats and headsets equipped with EEG and other biometric sensors monitor the wearer’s brain waves and physiological markers for signs of fatigue, including incidents of microsleep or “headbobs.” Tests are also currently underway for a promising, wrist-worn, sleep tracker that measures fatigue as an impairment much like intoxication. For example, a driver would receive a notification when fatigue levels approach 70%, which is similar to a blood alcohol level of 0.08% (AlertDriving). In the Game of Supply Chain Management, there are many players and moving parts to keep track of. Cloud-based GPS and Radio Frequency Identification (RFID) technologies are becoming more and more sophisticated, which will give supply chain managers greater visibility into product location and condition. For example, by putting an RFID chip in a pallet, and integrating that chip with a device placed in a vehicle, the device can transmit useful data about that pallet—like GPS coordinates or temperature—back to a key stakeholder. Other useful data such as weather or traffic conditions and average speed of driver can also be pulled in. This elevated connectivity gives all parties in the supply chain deeper insight into their shipments (Inbound Logistics). We know a certain Khaleesi who could use an RFID tracker right about now.